Young Josh is very brave. Nothing scares him. Well, except for the dark, ghosts, pirates, boy-eating dinosaurs, monsters under the bed, dragons, vampires … but other than that, nothing. Together with his faithful dog, Wolverine, Josh heads off to spend the holidays with Nan and Pop. 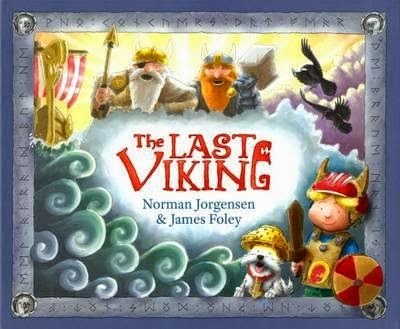 His grandfather has bought him a present: a book all about Vikings. And by the next morning, Josh has renamed himself Knut, after the great Viking warrior and king, and decided to follow the Norse gods. Meanwhile, way up in the sky, across a magical rainbow, those same Norse gods are passing time in Asgard, their home. It's been over a thousand years since anyone believed in them, so as soon as they hear about Josh/Knut's newfound allegiance, they can't resist keeping an eye on him. Which turns out to be rather a good thing! This is an intricately crafted picture book of the highest quality. A CBCA Notable Book in 2012, it manages to both entertain and inspire, while touching on issues ranging from childhood fears and bullying to the power of myth and storytelling. Josh's creativity as he builds a Viking longship is a joy to behold. His bravery in the face of terror as he marches out to confront a pack of bullying children is formidable. And the way in which his problems are resolved is delightful. There's a lovely wry humour running throughout this book that will give parents a great deal of enjoyment too. And I absolutely loved the way the illustrations are allowed to tell entire chunks of the story. In fact, I pretty much loved everything about this book, which is why I can't wait for the sequel due to be released this September. An excellent review of a truly wonderful book - on every level!